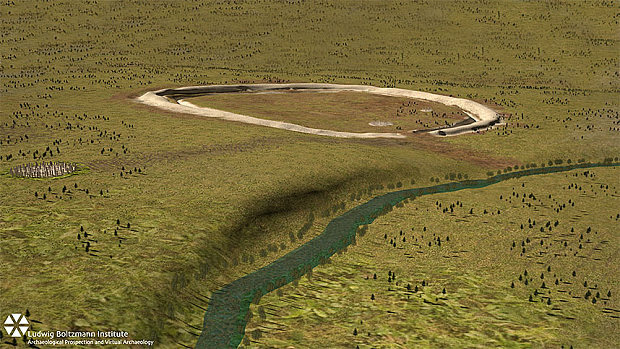 Huge ritual monument found hidden near Stonehenge. The super-henge of Durrington Walls has been hiding a secret for thousands of years. A huge row of megalithic stones buried beneath. A huge ritual monument which dates from the time of Stonehenge has been discovered hidden under the bank of a nearby stone-age enclosure. Durrington Walls, a roundish ‘super-henge’ has long puzzled archaeologists because one side is straight while the rest of the structure is curved. As early as 1810, historian Richard Colt Hoare suggested that its shape had been left ‘much mutilated’ by centuries of agriculture. But now ground penetrating radar has found that the straight edge is actually aligned over a row of 90 massive standing stones which once stood 15ft high, and formed a c-shaped arena which has not been seen for thousands of years. The stone line, which curves into a c-shape towards one end, is likely to have marked a ritual procession route, and is thought to date from the same time as the sarsen circle at Stonehenge. Archaeologists believe the stones were pushed over and a bank built on top, but they are still trying to work out exactly why they were built. Nothing exists like it in the world. “It’s utterly remarkable,” said Professor Vince Gaffney, of the University of Bradford. “It’s just enormous. It is definitely one of the largest stone monuments in Europe and is completely unique. We’ve never seen anything like this in the world. “We can’t tell what the stones are made of, but they are the same height as the sarsens in the Stonehenge circle, so they may be the same kind. “It was probably for a ritual of some sort, or it could have marked out an arena. These monuments were very theatrical. This a design to impress and empower. 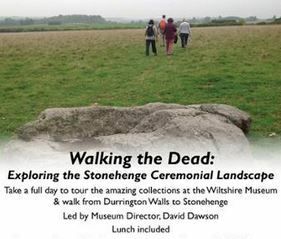 Durrington Walls, which sits in a depression not far from the River Avon, near Amesbury, Wiltshire, is one of the largest known henge monuments, measuring around 1,640 feet in diameter and built around 4,500 years ago in the Neolithic, or new stone age. It is surrounded by a ditch of up to 54ft wide and a bank of more than three foot high and is built on the same summer solstice alignment as Stonehenge. Some archaeoolgists have suggested that the builders of Stonehenge lived at Durrington. A nearby wooden structure, called Wood Henge was thought to represent the land of the living while Stonehenge represented the realm of the dead. But the discovery of the stones suggests that Durrington Walls had a far earlier and less domestic history than has previously been supposed. The Bradford archaeologists have been working alongside an international team of experts as part of the Stonehenge Hidden Landscapes project which has been mapping the entire area around with the latest technology. 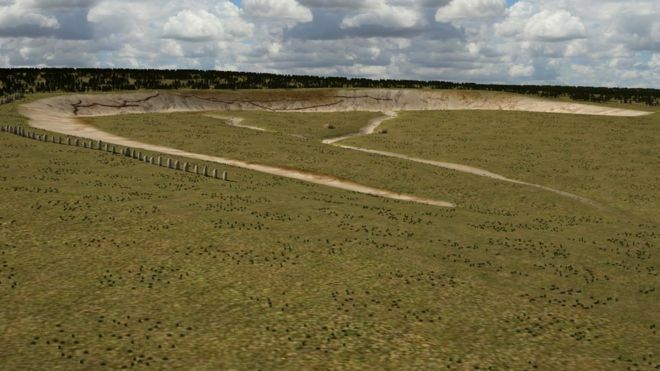 “Everything previously written about the Stonehenge landscape and the ancient monuments within it will need to be re-written,” said Paul Garwood, Senior Lecturer in Archaeology at the University of Birmingham and principle prehistorian on the project. The research will be presented at the British Science Festival in Bradford this week.